Background/Purpose: Clinical evaluation of efficacy and safety for long-term treatment for ankylosing spondylitis (AS) is important for treatment decision-making. Secukinumab (SEC), a fully human mAb that selectively neutralizes IL-17A, is the only approved bDMARD for the treatment of AS other than anti-TNFs.1 Here, we report long-term end-of-study (5 year) efficacy and safety results of the MEASURE 1 extension trial (NCT01863732), including outcomes in patients (pts) who had dose escalation from SEC 75 mg to 150 mg during the study. Methods: Pts were initially randomized to receive intravenous (IV) SEC 10 mg/kg at baseline, Weeks (Wks) 2 and 4, followed by subcutaneous (SC) SEC 150 mg (IV→150 mg) or 75 mg (IV→75 mg) every 4 wks thereafter or matched placebo (PBO). Based on ASAS20 response at Wk 16, PBO pts were re-randomized to secukinumab 150 or 75 mg SC at Wk 16 (non-responders) or Wk 24 (responders). After the 2-year core trial, 274 pts entered the 3-year extension study. Detailed study design has been reported previously1. Dose escalation from SEC 75 mg to 150 mg was allowed following a protocol amendment. Assessments at Wk 260 included ASAS20, ASAS40, ASAS5/6 and other efficacy outcomes (reported as observed). Clinical efficacy including dose escalation results are reported for all pts who entered the extension trial (i.e. including placebo-switchers); former is based on randomized dose whereas latter is based on treatment dose. Safety is reported as exposure adjusted incidence rate (EAIR)/100 pt-years for all pts (n = 360) who received ≥1 dose of study treatment. Results: A total of 84.4% (108/128) and 83.6% (122/146) of all the pts (i.e. including PBO switchers) who received SEC 150 mg and 75 mg, respectively, completed 260 wks of treatment. Improvements in ASAS20, ASAS40, BASDAI50, and other efficacy outcomes were sustained through Wk 260 (Table). 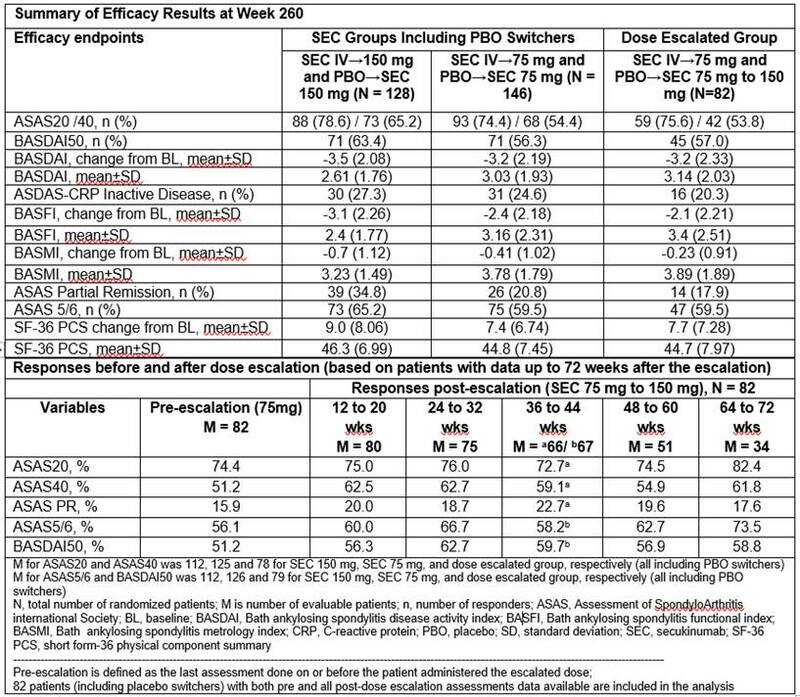 A total of 82 pts on SEC 75 mg (56.2% of total 75 mg population) had dose escalated to 150 mg after Week 168; ASAS40, ASAS PR, ASAS 5/6, and BASDAI50 responses were improved in pts whose dose was escalated from SEC 75 mg to 150 mg (Table). Across the entire treatment period (SEC exposure [mean±SD]: 206.6±90.17 weeks), SEC was well tolerated with a safety profile consistent over the course of the study. EAIRs of selected adverse events of interest were 0.1, 0.6, 1.8 and 0.5 per 100 pt-years for ulcerative colitis, Crohn’s disease, uveitis and malignant/unspecified tumors, respectively. Disclosure: X. Baraliakos, AbbVie, Bristol-Myers Squibb, Celgene, Chugai, Janssen, MSD, Novartis, Pfizer and UCB Pharma, 2, 5, 8; J. Braun, Abbvie (Abbott), Amgen, BMS, Boehringer, Celgene, Celltrion, Centocor, Chugai, EBEWE Pharma, Medac, MSD (Schering-Plough), Mundipharma, Novartis, Pfizer (Wyeth), Roche, Sanofi-Aventis and UCB, 2, 5,Abbvie (Abbott), Amgen, BMS, Boehringer, Celgene, Celltrion, Centocor, Chugai, EBEWE Pharma, Medac, MSD (Schering-Plough), Mundipharma, Novartis, Pfizer (Wyeth), Roche, Sanofi- Aventis and UCB, 8; A. A. Deodhar, AbbVie Inc., 2,Eli Lilly and Co., 2, 5,Janssen, 2, 5,Novartis, 2, 5,Pfizer, Inc., 2, 5,UCB, Inc., 2, 5,Sun pharma, 2; D. Poddubnyy, AbbVie, Janssen, MSD, Novartis, Pfizer, BMS, Boehringer, UCB and Roche, 2, 5, 8; A. J. Kivitz, AbbVie, Pfizer, Genentech, UCB, Sanofi/Regeneron and Celgene, 5,: Celgene, Pfizer, Sanofi/Regeneron, Horizon and Merck, 8; H. Tahir, Novartis, Eli Lilly, and AbbVie, 8; F. van Den Bosch, AbbVie, Bristol-Myers Squibb, Celgene, Eli Lilly and Co., Janssen, Merck, Novartis, Pfizer, Sanofi, UCB, 2, 5, 8; E. M. Delicha, Novartis, 3; Z. Talloczy, Novartis, 1, 3; A. Fierlinger, Novartis, 1, 3. Baraliakos X, Braun J, Deodhar AA, Poddubnyy D, Kivitz AJ, Tahir H, van Den Bosch F, Delicha EM, Talloczy Z, Fierlinger A. Long-Term Evaluation of Secukinumab in Ankylosing Spondylitis: 5 Year Efficacy and Safety Results from a Phase 3 Trial [abstract]. Arthritis Rheumatol. 2018; 70 (suppl 10). 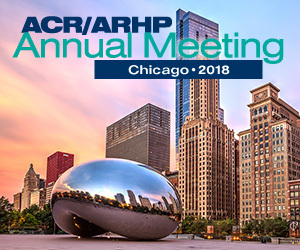 https://acrabstracts.org/abstract/long-term-evaluation-of-secukinumab-in-ankylosing-spondylitis-5-year-efficacy-and-safety-results-from-a-phase-3-trial/. Accessed April 21, 2019.